So … I sort of half-intentionally, half-by-accident, took the summer off. Halfway through July I realized I hadn’t posted much at all, and I thought I’d take a nice break from blogging, and then dive back in once school started up again. Well heck, we’re almost done with September, the kids have been in school since the last days of August, and I still haven’t posted! 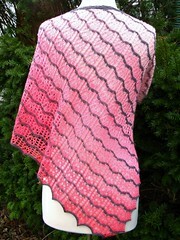 My thanks go out to a knitting-circle friend (Hi, Jane!) who kindly brought this absence to my attention. Time to get back to blogging, dear reader, and I hope you haven’t given up on me! Can’t sort what’s hiding … so I got it ALL out. I mean everything! 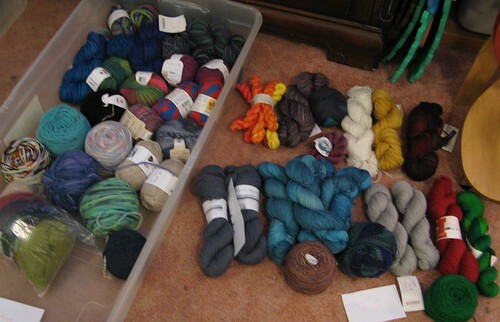 Old stash, new stash, the 2nd ball for the WIP … everything! So … this part kind of sucked, but essentially I sorted my Rav stash by yarn weight, and then went through one entry at a time. I laid hands on the yarn for each Rav stash entry, or updated the entry to reflect reality (oh yeah, I gave that skein to a friend) (oh yeah, I finished that project but forgot to update my Rav stash). Any yarn leftover after I’d gone through ALL of my Rav stash entries needed to be photographed and entered. Before I started, I made a bunch of categories up and wrote them on 3×5 cards and made stations all around the living room. As I touched each bit of yarn, I also decided where it should live …. and here are the results! 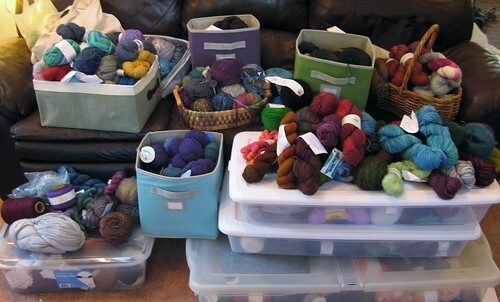 I’m proud to report that my total yardage (according to my Rav stash) went from 81K to 50K. Some yarn is extra pretty, or has memories attached, or is just the right amount for specific short-notice projects (Baby Surprise Jacket, etc.). That yarn I keep, regardless. Yarn I like but isn’t quite in that category has to be assigned to a project! If I couldn’t find a single project on Rav for that yarn, away it goes to some other category. Yarn in good condition, I listed on Rav as “For Sale or Trade” (FSOT) along with price and shipping details. 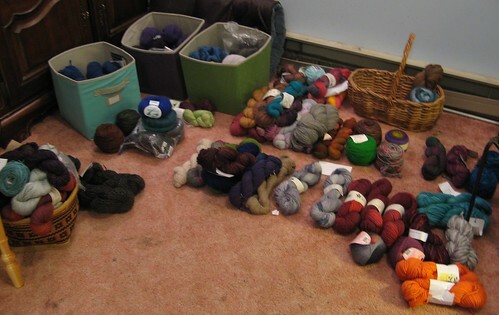 I actually sold my first skein before I was even done sorting. Most of what you see in the photo below is already gone, so don’t get too excited! But, know that FSOT is a great place to look for yarn, and it’s a great place to re-home yarn while putting a little extra change in your wallet. I usually knock a few dollars off the retail price, and include S&H to the continental US. 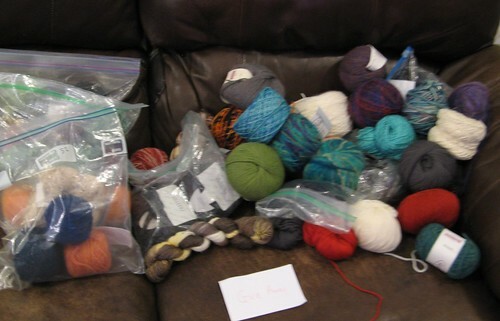 Partial skeins, unlabeled balls, and orphans went into this pile. I brought it to the next few knit nights, and made my friends happy with yarn! It was awesome. I keep a box of yarn given to me by companies specifically to develop designs. I don’t feel comfortable using this yarn (even in leftover format) for personal use, so I keep it for swatching for future projects. 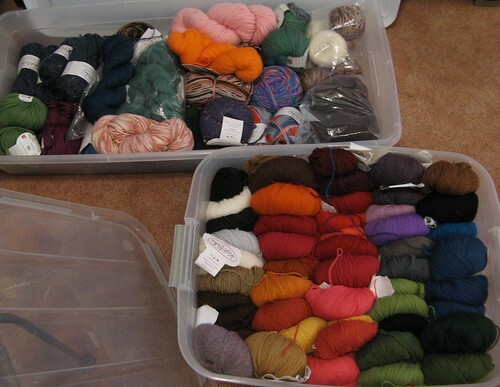 I went through this box and took out any yarn that was no longer in production (most of that went to “Give Away”). I also keep a bag of worsted-weight wool in pretty colors for teaching kids. The yarn in these two categories doesn’t belong in my Rav stash, since I won’t be using it for projects, nor would I sell it or give it away. I tossed tiny balls, old gross acrylic, and called it a day. Phew!